Press Release | What is Ammonia Gas? The New York Department of Health describes ammonia gas as a colorless, alkaline gas comprised of nitrogen and hydrogen (NH3) that has a strong odor, often associated with window cleaner. Ammonia is a natural, biological agent in organisms that helps to form amino acids, which are the basic building blocks of proteins. It also involved in the natural decomposition of plant and animal materials. When present in higher concentrations, ammonia gas is hazardous to workers and the public. What is ammonia gas used for? 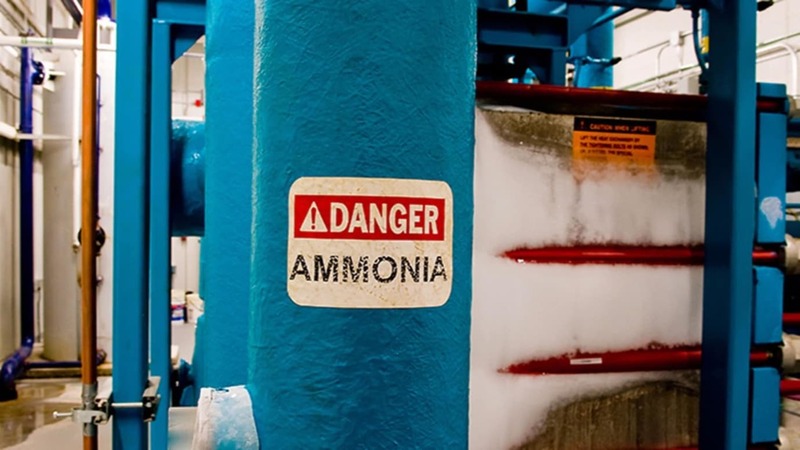 According to the National Institute for Occupational Safety and Health, ammonia has boiling temperature of -33°C (-28°F) — ammonia is a gas a room temperature. While it is lighter than air, a release of pressurized ammonia gas can collect at ground-level until the aerosol cloud becomes diluted and begins to rise. Dilute ammonia gas that has left the cloud / vapor phase will generally not collect in low-lying areas such as heavier-than-air gases such as hydrogen sulfide (H2S). Ammonia gas is very hydrophilic, meaning it is water-loving. When stored as a gas or compressed liquid without presence of water moisture, ammonia is referred to as anhydrous ammonia. Upon release to the environment, ammonia gas is very quick to attach itself to moisture, such as found in a person’s eyes, mouth, throat, lungs and on his or her skin. Ammonia is very caustic, forming ammonium hydroxide that has a higher pH than water and can damage respiratory systems, disrupt vision and irritate or burn skin upon contact. The caustic action of ammonium hydroxide damages cell membranes, causing more liquid to be released that further interacts with ammonia gas, perpetuating the effects on the human body. Although not every organization agrees on the perceptible threshold, OSHA estimates that people begins to smell ammonia gas ranging from 5 to 50 ppm. Experience in the industry indicates that workers consistently subjected to weak ammonia levels may become somewhat desensitized to its presence. According to Alberta Agriculture and Forestry, nose and throat irritation can result from ammonia exposure ranging from 24–50 parts per million (ppm) after ten minutes of exposure. With a higher ammonia concentration ranging from 72–134 ppm, the same irritation can occur in half the time. For a concentration of 700 ppm, immediate and severe irritation would likely occur. At a concentration of 5,000 ppm, respiratory spasms and rapid suffocation occurs. At 10,000 ppm, pulmonary edema and potentially fatal accumulation of liquid in the lungs would occur. As with all safety regulations, the safe work exposure limits for ammonia vary from region to region. In the United Kingdom, the Health and Safety Executive specifies safe exposure limits for ammonia gas as 25 ppm for an eight-hour time-weighted average (TWA) and 35 ppm for a 15-minute short-term exposure limit (STEL). In the United States, OSHA specifies the permissible exposure limit (PEL) for ammonia gas as 50 ppm for an eight-hour TWA, allowing a higher limit of 100 ppm for a shorter four-hour TWA. The recommended exposure limit (REL) specified by the National Institute for Occupational Safety and Health (NIOSH) is 25 ppm for an eight-hour TWA. NIOSH specifies the immediately dangerous to life or health concentration (IDLH) at 500 ppm. While ammonia gas has a broad range of uses, from a refrigerant and fertilizer to being a raw material for many processes, it’s hazardous to the health of nearby workers and the public. Personal gas detection with an ammonia sensor is an invaluable method for businesses to help personnel keep an eye on safe work environments and the potential for ammonia gas exposure. Wireless gas detection and communications solves the challenge of triggering an emergency response when a worker has been exposed to ammonia gas and cannot self-rescue. Blackline Safety developed its G7 wireless gas detection and lone worker monitors to solve this exact problem — to empower a real-time emergency response for when seconds count. G7 features an ammonia gas sensor option that alerts live monitoring personnel when an employee needs help, directing responders to the employee’s exact location. Best of all, G7 safety monitoring technology and cloud-based monitoring portal are a turnkey solution that don’t rely on facility Wi-Fi networks or power to operate. As a standalone system, no smartphones or Bluetooth connections are required. Let us know if you have any questions on how G7 may be able to complement your gas detection or lone worker monitoring programs. Blackline Safety Corp. is a publicly traded wireless location leader (TSX.V: BLN) that develops, manufactures and markets products and services for worker safety monitoring. Headquartered in Calgary, Canada, we employ over 60 talented personnel with a diverse array of skillsets, allowing us to fulfill our customers’ requirements. We have a global reach with an office in the the United Kingdom, a growing international distribution network, and capability to deliver services in over 200 countries.